There are two major collections of Sylvia Plath materials. These archives are held at the Mortimer Rare Book Room at Smith College and the Lilly Library at Indiana University, Bloomington. Other smaller collections exist throughout the United States. the United Kingdom, and elsewhere. I will try to find and highlight these collections in case you should be able to go and visit them. The University of North Carolina, at Chapel Hill, has a very respectible collection of Plath (& Ted Hughes) materials. Held in the Rare Book Collection at the Wilson Library, the Sylvia Plath and Ted Hughes Collections "contain approximately 1000 bibliographic items written in whole or in part by the American poet, Sylvia Plath, and her husband and English poet laureate, Ted Hughes. Both collections include first and later lifetime editions, proof copies and other bibliographical variants, broadsides, private press printings, and separate periodical appearances. The collection of Sylvia Plath is especially comprehensive and includes a number of extreme rarities, among them uncorrected proof copies of The Colossus (1960), The Bell Jar (1963), and Ariel (1965). The collection of Hughes also contains an abundance of proof copies and other variants and a complete run of the publications of the Rainbow Press, directed by Hughes and his sister Olwyn. Many of the private press printings were illustrated by the American artist Leonard Baskin. The core portions of both collections were the gifts of James R. and Mary M. Patton. The Rare Book Collection has added substantially to their gifts through purchases in the antiquarian book market." Sylvia Plath. Three Women. (1962). A small collection of materials relating to the publication of Plath's verse-play, which first appeared in a BBC radio production in August 1962. The collection includes a copy of the mimeographed script employed in the original radio broadcast (S. Tabor, An Analytical Bibliographical of Sylvia Plath, A3a) and later used by the designer, Stanislawa Gliwy, for his production of the Turret Press edition of the work (Tabor A3b.1). This copy is marked up with Gliwy's directions to the printer and is accompanied by a full mock-up of the printed version as well a variety of proof states of selected text pages and of the linocut illustrations. The collection also contains a copy of the final Turret Press edition in unbound sheets. Acquired on the Weil Fund. Uncataloged. Sylvia Plath. Colossus. New York: Knopf, 1962. First American edition of Plath's first full volume of poetry. This copy is especially interesting as it is inscribed by the author to Alfred Young Fisher, her former poetry professor at Smith College. The book is accompanied by a letter to Professor Fisher, affirming the importance of his teaching for her and requesting his intervention in securing several reams of pink Smith College memo paper, which she commonly used for early drafts of her poems. She enclosed a sample of the paper with the letter. Gift of Mr. F. Weston Fenhagen. Call Number: RBC Patton PS3566.L27 C6 1962, copy 3. Sylvia Plath. Ariel. London: Faber and Faber, 1965. First edition. This copy is inscribed by Ted Hughes (Plath's husband and the editor of this posthumous work) to Robert Lowell, once Plath's teacher and later the author of the introduction to the American edition of Ariel (1966). Call Number: RBC Patton PS3566.L27 A7 1965, copy 1. The Call for Papers for the Sylvia Plath 75th Anniversary Symposium, to be held at Oxford, is closing today, 15 May, 2007. If you have already submitted, please do so soon!! Abstract notification and Symposium booking start date: June 15, 2007. As I can, I will add links to the list of books by Plath and about Plath in the sidebar to the right. The links all currently go to Amazon.com, but I recommend searching Abebooks.com first for any purchases of Sylvia Plath books, both old and new. If ever you click a link (if ever anyone can find this blog) and the link does not work, but let me know. 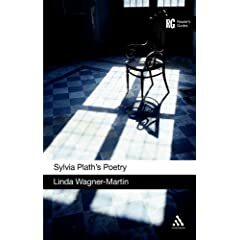 Sylvia Plath's Poetry, by Linda Wagner-Martin is published today. The ISBN number is 082648932X. In paperback, the book will cost $14.95; hardback is listed at $75.00. The publisher is Continuum International Publishing Group and the book is 176 pages. Below is a list a artists (actors, actresses, writers, etc.) that will be present at the Oxford Symposium. Others may be added.